Many people love making beaded medallions. There are some nifty advantages. Short of time? Some medallions can be used as pendants and earrings. But a favorite design can be repeated for bracelets and necklace. Medallions also suit those who prefer working in short bursts but still want to get some pleasure in finishing something. If this is you, then you will like this new book by Sabine Lippert which I recently received for review. 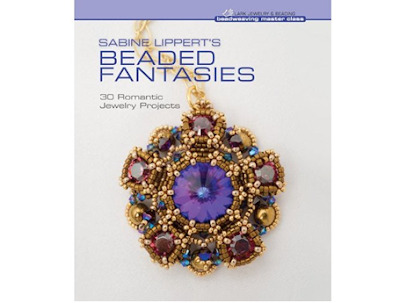 Sabine's Beaded Fantasies book is chock full of beaded medallions and other jewelry which feature repetitive design elements. The author does deliver on the romantic theme with many lovely intricate designs. Sabine's ability to add layers of detail and color is indeed extraordinary. Sabine is a German based bead artisan who beads every spare moment she has when she is not working as an urologist. 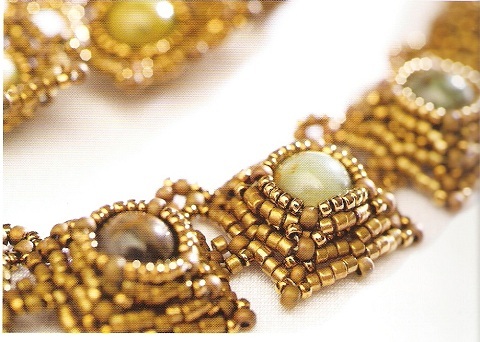 Her ability to come up with such fine designs is attributed to her genes and her upbringing. She said in an interview, "My father was an engineer and I still remember his words: " You can disassemble anything so long as you remember the steps to reassemble it later on. He taught me to be curious. My mother, a very talented painter gave me my creative side." While there are a number of simpler projects, her master class book is best for intermediate and advanced beaders. The jewelry pieces included necklaces including chokers, bracelets, earrings and brooches but no rings. That should not be an issue with ring lovers because many of the medallion designs can be converted into rings. Sabine is a huge RAW (right angle weave) enthusiast so this stitch rules in her book. She also uses peyote. I enjoyed reading her final chapter where she explains her creative process. She makes intuitive color choices and lets her designs led her onto the next one. There are two free tutorials. Both designs were among my list of favorites although I am hard pressed to choose which are my favorite medallions. The Purple Rope necklace appealed to me for its striking boldness. This design will look great with simple shift dresses or strapless gowns. 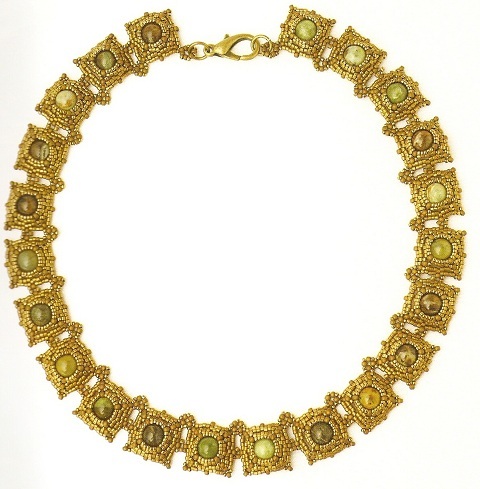 I really liked the Les Fleurs necklace too because it looked like it might have graced a noble lady at a medieval royal court. No wonder Sabine is now a Swarovski Elements Ambassador. She clearly loves the crystals and uses them frequently. 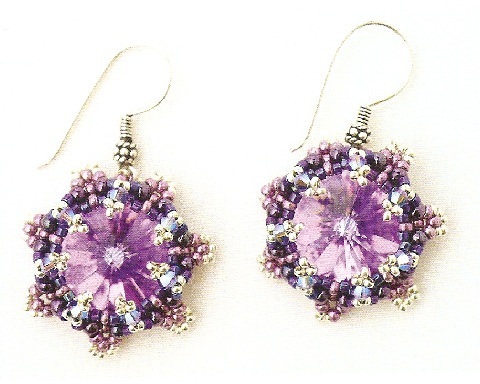 Rivolis feature in some of her designs such as this gorgeous Sweet Eighteen earrings. The Volcanoes necklace is a lovely vision which somehow reminds me of Roman mosaics. It is also well named. The close up shows why. The book does seem to be text rich at first glance even though there are also a number of accompanying diagrams. But given the intricacy of many of the designs, it is not surprising to see such thoroughness. The patience is worth it because designs are truly inspirational. Lovely book. Just went to Amazon and browsed it via their "Search this Book" feature. I'm very impressed and am adding it to my Amazon wish list. I love, love, love this book. I bought it about a month ago and already made seven copies of the Granada brooch. I keep trying new colors and love all of them. I am going to try to convert them into necklace/brooch combinations. I love this book! I just finished the earring pattern "Sweet 18". For me I made it "Sweet 12". The 18mm rivoli made the earrings way too big so I used a 12mm rivoli instead. I found a couple errors with the pattern.....Like the rivoli kept falling out. Gotta have beads to hold the thing in place! Who knows maybe Sabine used glue.